The question of royal succession is one of the most pressing problems for the monarchies on the Arabian Peninsula. In the wake of Saudi Arabia, which has recently just gone through its own change of leadership, the Sultanate of Oman is facing a similar problem; since July 2014 the Omani leader Sultan Qaboos bin Said al Said has been undergoing medical treatment in a clinic in Germany. Both Arab and Western media have claimed that the Sultan is being treated for colorectal cancer. The fact that the Sultan was neither present in the country on his birthday (November 18), a day which is considered the country’s largest national holiday, nor present at the funeral of Abdullah, king of Saudi Arabia, compounds rumours that the leader is in a bad way. The situation regarding the 74-year-old monarch is especially delicate as he has no direct descendants. The Sultan came into power in 1970 as a result of the overthrow of his father with the help of British Special Forces and in 1976 married his cousin, the daughter of his uncle Sayyid Tariq bin Taimur Al Said. The marriage yielded no children and the couple divorced in 1979; the Sultan did not remarry. Outside observers are paying very close attention to Oman’s future leadership change. This is primarily because of the potential power that the Sultanate could yield; Oman’s geographical position grants the country the possibility to exert control, together with Iran, over the shipping that passes through the Strait of Hormuz. Indeed, 30% of the world’s oil passes through the Strait; therefore the whole world is concerned about the peaceful transition of power in the country. 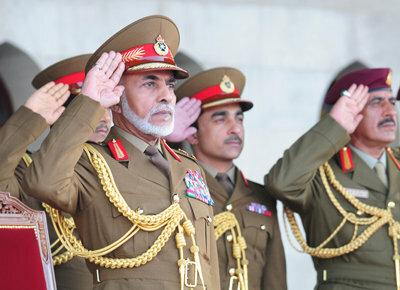 Over the last ten years Oman has been an important link between Iran and the Arab monarchies of the Arabian Peninsula. Oman has also repeatedly helped organise meetings between Iran and the West in regard to Tehran’s nuclear programme. According to the online newspaper Al-Monitor, Oman only very recently hosted secret talks between America and Iran. Experts predict that the possible loss of Qaboos would be a serious stumbling block in the ongoing nuclear talks with Iran; for all sides involved, the Sultan was a convenient and neutral link in the negotiations between Iran and the West. Oman’s achievements also include the successful negotiations which facilitated the return of Al-Qaeda hostages from Yemen, the release of American tourists accused of espionage in Tehran, and also the release of British sailors captured by Iranian soldiers in 2007. On top of this, Oman has its own seat on the Cooperation Council for the Arab States of the Gulf, a position even Saudi Arabia has to respect. Judging from the Sultanate’s rhetoric and actions, Muscat does not officially intend to interfere in regional and inter-Arab disagreements and instead it works to support dialogue with its neighbours. The country’s policy in this regard seems to be connected with the fact that around 75% of Omani citizens are Ibadi Muslims, an Islamic denomination which is considered to be the most moderate. Both conservatism and tolerance are considered inherent characteristics of Ibadism; Ibadi Muslims renounce killing for religious and political reasons and they preach patience to other Islamic denominations. Discussions about the Sultan’s successor have been going on for a long time. In 1997 he officially declared that he had written two names down on paper in descending order and put them in sealed envelopes which were then placed in two separate parts of the country. The envelopes are to be opened after his death. Since 1997 there has been much speculation regarding possible candidates for the Omani throne. The most probable candidates mentioned by the Arab and Western media are the sons of Qaboos’ brother on his father’s side, the former Prime Minister of Oman: Sayyid Tariq bin Taimur. The eldest son, Sayyid As‘ad bin Tatiq, is 60 years old. He graduated from the Royal Military Academy Sandhurst, as did Qaboos in his youth, and he is currently the personal representative of Sultan Qaboos. The second candidate is the stepbrother of Sultan Qaboos, Sayyid Haitham. He is also 60 years old and was educated in Paris in the Sorbonne. He is the former head of the Ministry of Foreign Affairs and since 2002 he has been the Minister of Heritage and National Culture. The third candidate is Haitham’s brother- Sayyid Shihab. He will turn 60 this year. He holds the title Vice-Admiral, he used to command the Omani Navy, and since 2004 he has been advisor to the head of state, while simultaneously heading the Research Council of Oman. The three potential candidates number amongst some of the richest people in Oman, they hold practically all of the country’s important assets in their hands. However, is one of these men ready to shoulder the burden of taking responsibility for a sovereign nation, and is Omani society ready for the arrival of a new leader on the throne? Let’s not forget that when Qaboos wrested control of the country from his father a civil war was blazing, Oman had only 10 kilometres of modern roads, and there was a complete absence of national industry, an education system, or even a healthcare system. The Sultan managed to not only halt the country’s decline but to also set up (in a very short time historically speaking) one of the most stable and well managed states in the Middle East. Thanks to him Oman stepped from the middle ages into the 20th century. The majority of Oman’s population of 4 million people have never known a ruler other than the current Sultan. His role and achievements as a reformer are lauded across the country, even in the once-mutinous Governorate of Dhofar. With this in mind, every action of a new Sultan will be closely compared with the policies of his predecessor. Indeed in recent times, especially since the beginning of the so-called ‘Arab Spring’, Oman’s problems have been building up and they will require attention sooner rather than later. Let’s take for example the Omani economy’s reliance on oil. In this respect Oman is like the other monarchies on the Persian Gulf, in Oman’s particular case it receives 79% of its income from the sale of oil. However the country’s oil reserves, unlike its neighbours, are not overly significant. With less ‘Black Gold’ being extracted, amidst a significant fall in the price of oil and limited financial reserves, there may be serious consequences for the internal political and social stability of the country, not to mention the future of large scale infrastructure projects. Thus, with a budget deficit, it will be increasingly difficult for a new leader to maintain the material wellbeing of Omanis. This problem is further compounded by the expectations of the Omani populace (56% of whom are under 25). There are expectations that the government will lift restrictions on the development of a civil society, that there will be more efforts to fight protectionism, favouritism, and corruption, and furthermore that the government will work to reduce unemployment levels in the country and to free political prisoners. The state of chaos in neighbouring Yemen also poses a serious threat to the internal stability of Oman. Muscat has expressed its deep concern about the possible destabilisation of the Sultanate’s western border. According to Omani and British experts, in the event that fighting spills across onto Omani territory, it is unlikely the small national army will be able to independently and completely guarantee the safety of the country.